Last week’s blog contained a teaser that there was further news to be broadcast to you all. 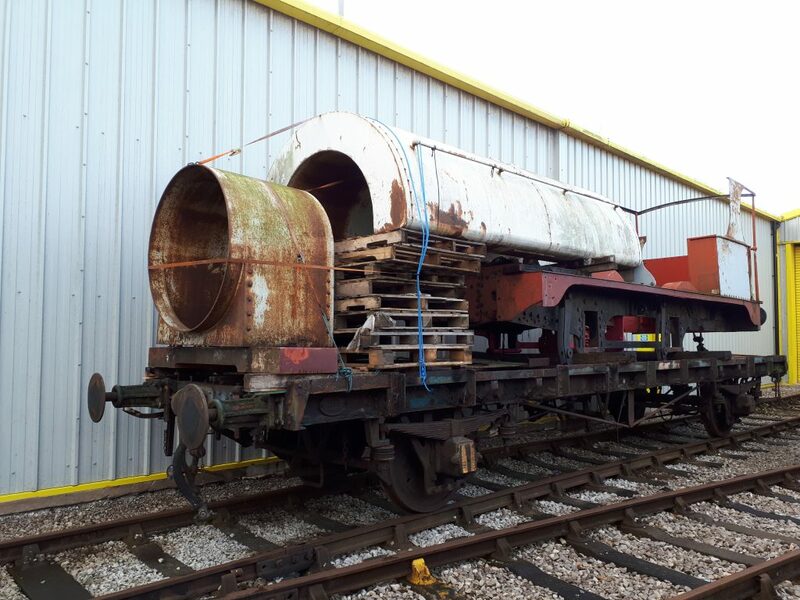 We can now reveal that the FRT has purchased a second-hand Collett 4,000 gallon tender tank that was advertised for sale nationally. 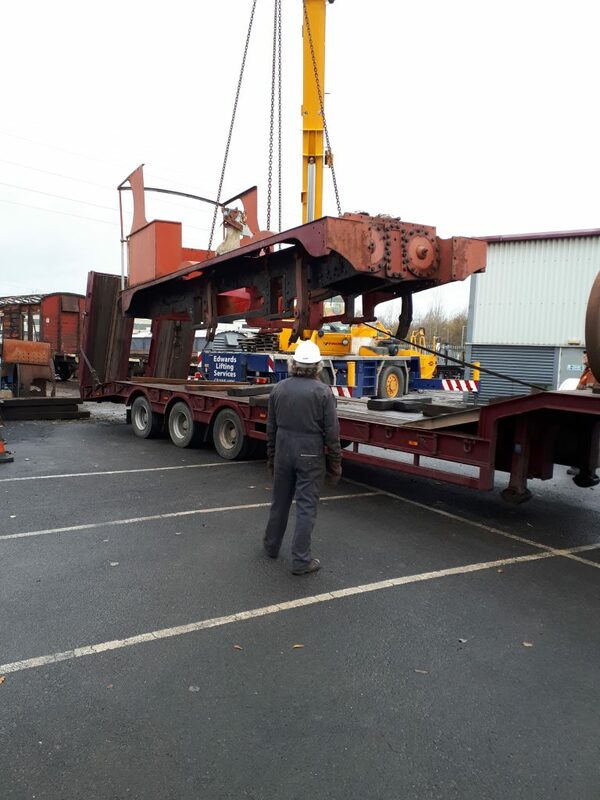 Keith went to look at it at Tyseley and deemed it suitable for further use and ideal for fitting to Wootton Hall‘s chassis which has been the subject of extensive repairs over the past few years. 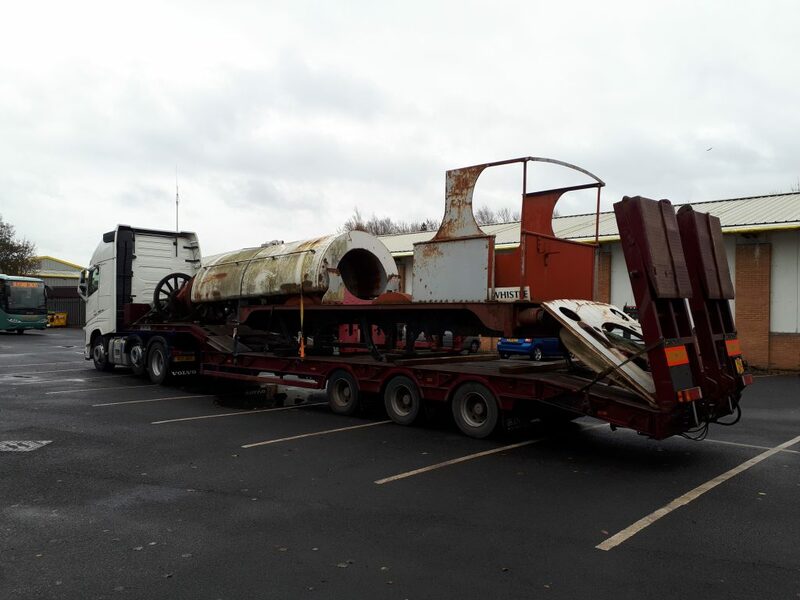 The tank is not expected to arrive at Preston until the New Year. 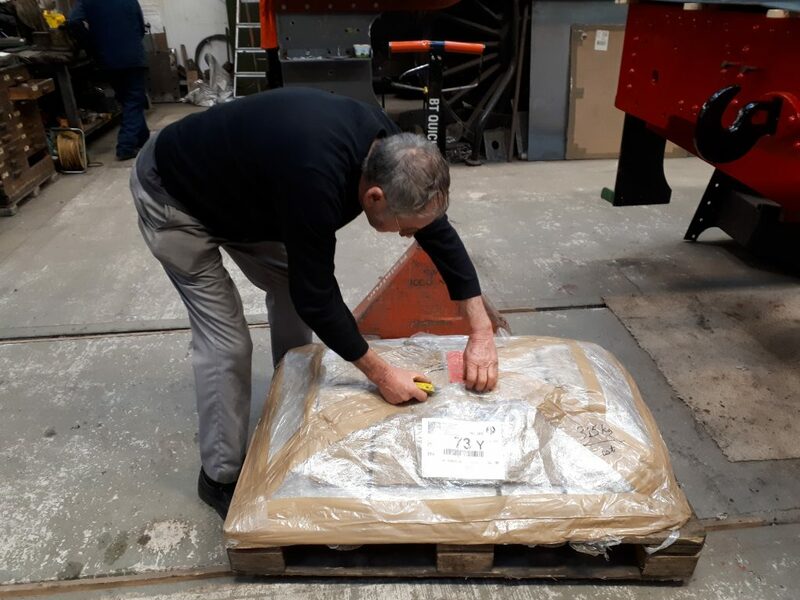 Keith is seen here opening another early birthday present on Wednesday when a set of newly cast axlebox underkeeps and brasses appeared in a delivery from the Severn Valley Railway. 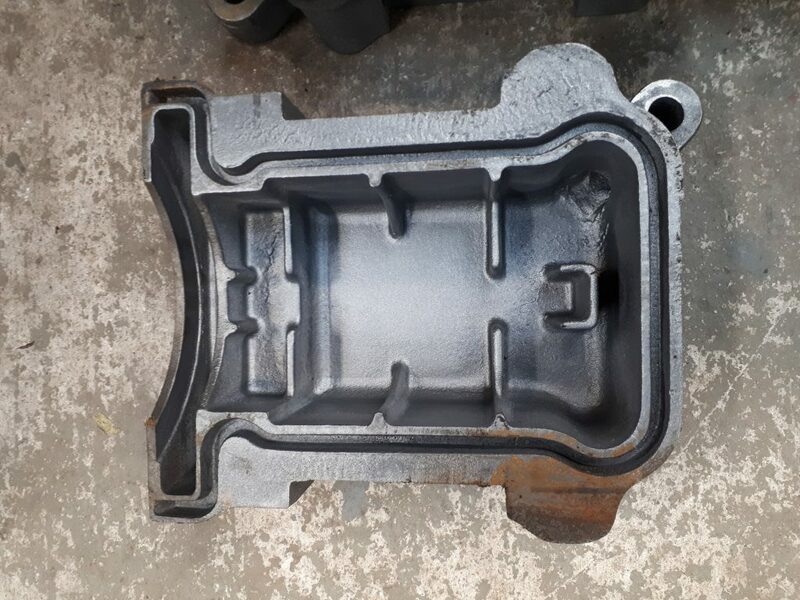 The axlebox underkeeps are indeed fine castings with no signs of corrective fettling, as can be seen here. 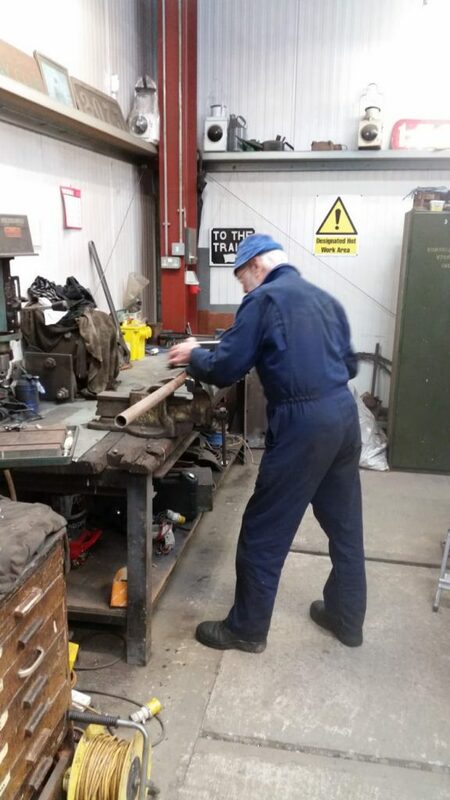 On the departure side, Adrian is seen here placing on to the delivery lorry a set of six springs from Wootton Hall‘s tender which are to be overhauled after over fifty years out of use. Two spare springs are to be manufactured at the same time. 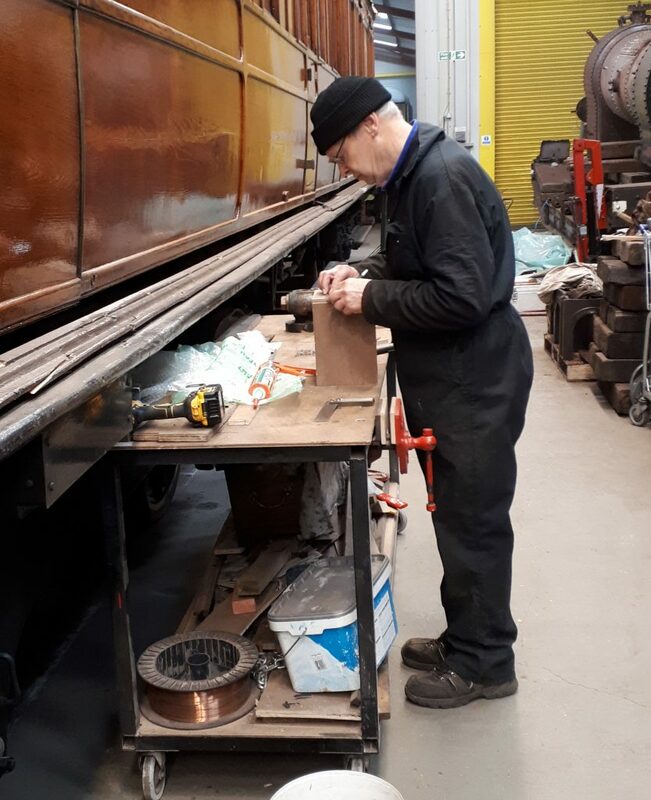 And talking of Wootton Hall, Keith is seen here temporarily fitting the right hand cab side in order to take measurements for boiler cladding and other fittings. Another view here with the cab side number plate fitted completely alters the appearance of the loco and shows signs of things to come! The main job on Wednesday was to jack up FR 20’s boiler to allow easier access from under the firebox. 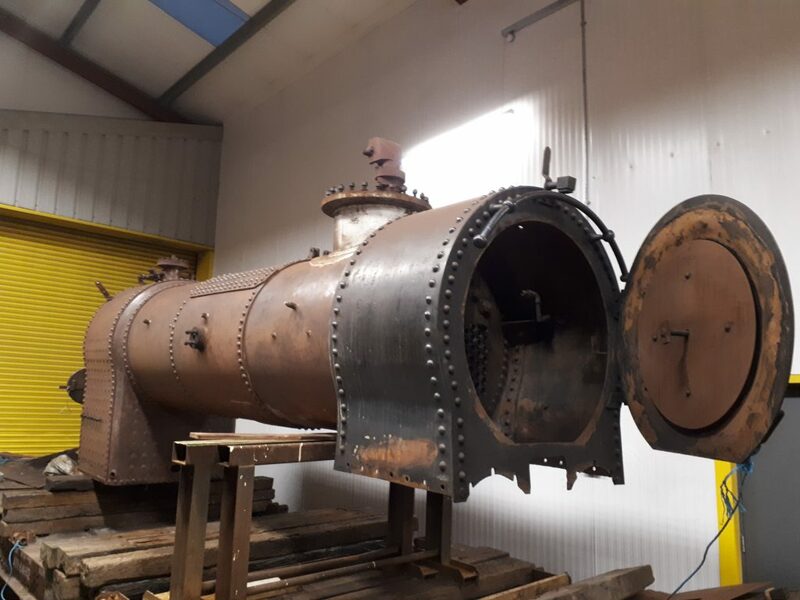 The front of the boiler is now positioned on steel stands. 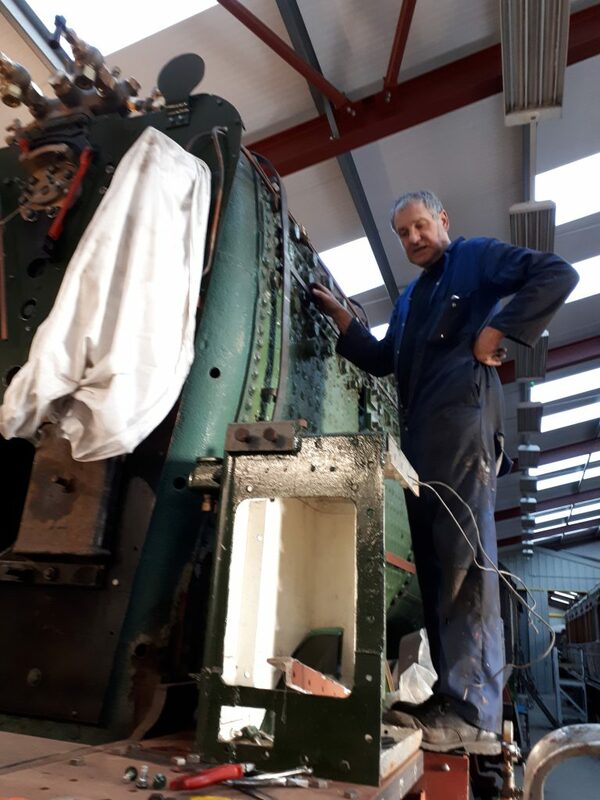 Elsewhere in the shed some smaller but nevertheless important jobs were tackled on Friday, including degreasing FR 20’s boiler cladding and rejuvenating steel trestles which had gone rusty after being used outside. The FRT Christmas dinner was held at The Ribble Pilot pub on Saturday when 19 members and guests sat down to meal. Looking forward to this next week, an NDT examination of FR 20’s boiler and Wootton Hall‘s tender wheelsets has been booked for this next Friday. The Iron Horse is now back with the printer after proof reading and, all being well, should be despatched to members before Christmas. The magazines will also contain membership renewal forms and it is hoped that you will all take the opportunity to return them quickly as we move towards yet another year with plenty of work on the horizon. Finally, we hope shortly to be able to publish the details of some planned working parties over the Christmas period. 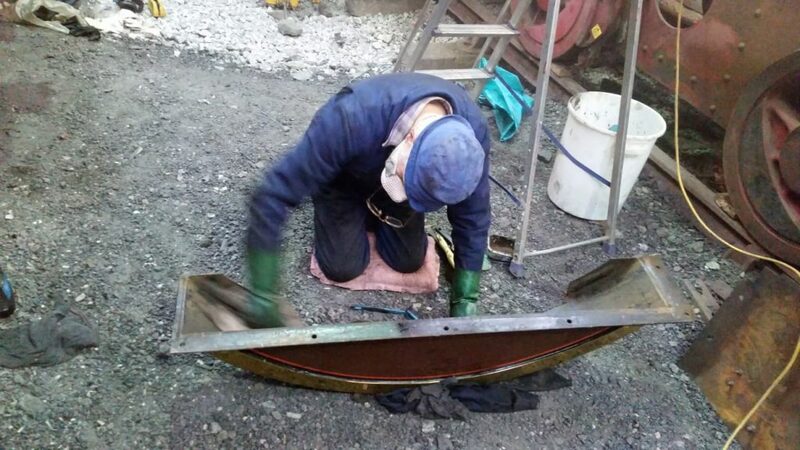 Much of volunteers’ time this week has been spent on the very basic but important task of cleaning up the motion, frames and boiler of Furness Railway No. 20. 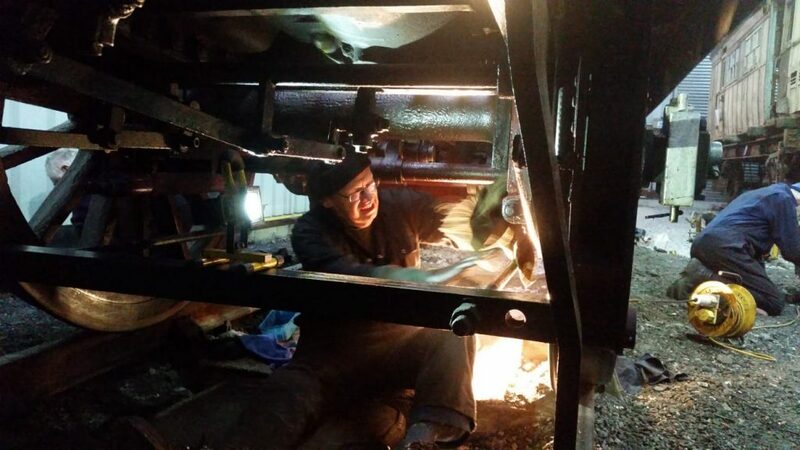 An undoubtedly dirty and sometimes very uncomfortable task, this type of work is sometimes inevitable during the day to day work of servicing and overhauling our locomotive fleet. 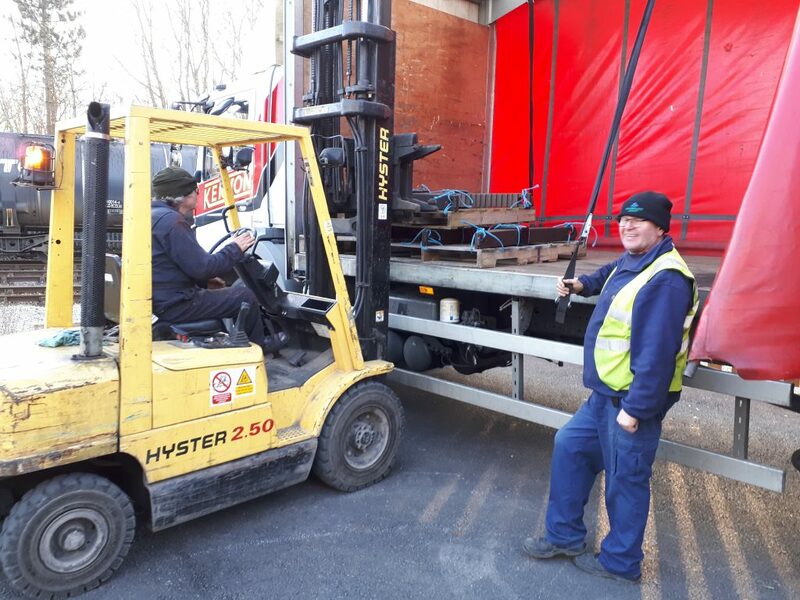 However, if the load is spread, as in this case, it doesn’t become too much of a burden on any one particular person and we are pleased to report that Mike, John Dixon, John Davis, Paul Balshaw, Tim, Roger and Fred have all buckled down to the job with the result that it has progressed extremely well. Hopefully we will soon be in a position whereby can move on to other more satisfying work! 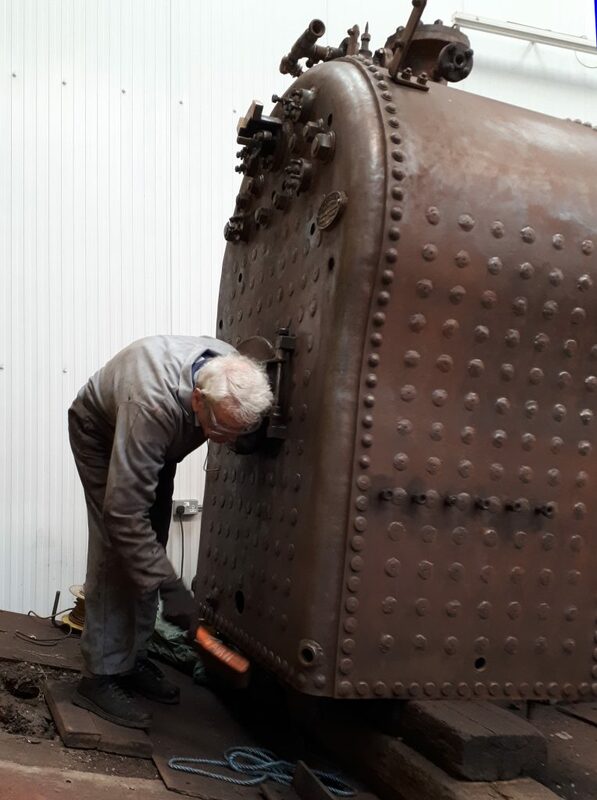 Andy Booth appeared on Sunday and has started the job of removing the tubes from FR 20’s boiler. Howard has made some more progress on Fluff with assistance from George, who came to give us a hand on Saturday. 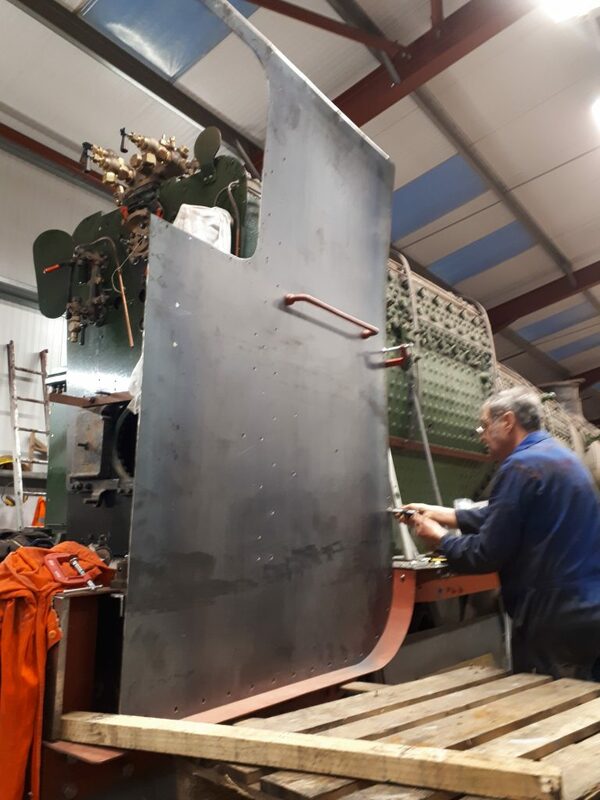 There was no riveting last Thursday as the gang is waiting for some special wedges which will enable the more awkward rivets to be fitted on Wootton Hall‘s tender frames. 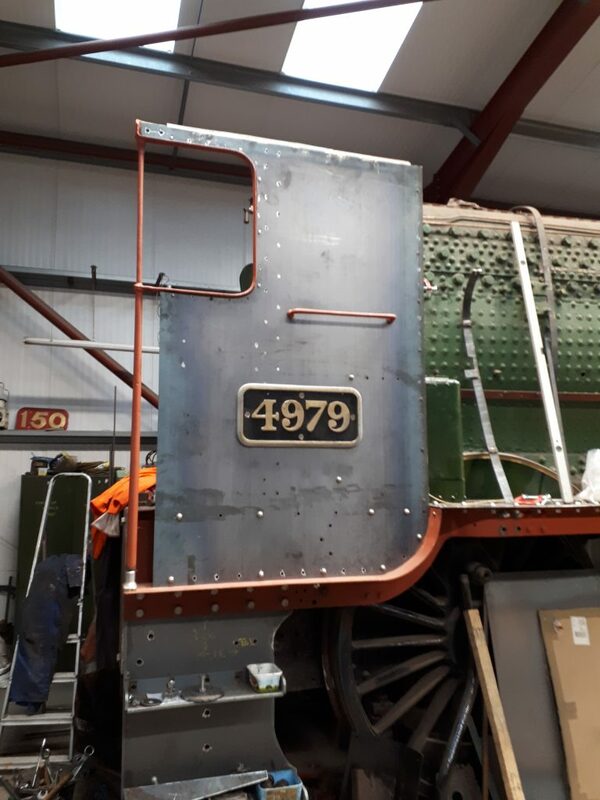 Meanwhile, more progress has been made on the upper platework for the tender frames and the test fitting of components. 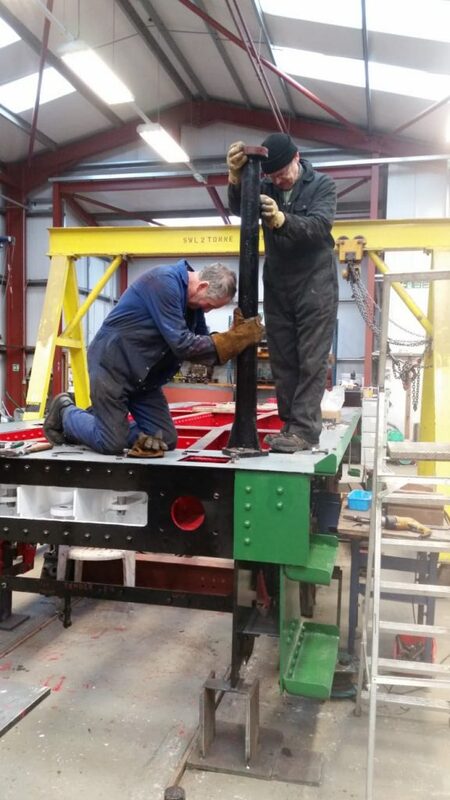 Keith has also been sizing up the position of the reverser stand on the loco frames so that other steelwork can be arranged around it. The RSR’s Santa Specials along with the FRT sales stand have again consumed much volunteer labour this last weekend. 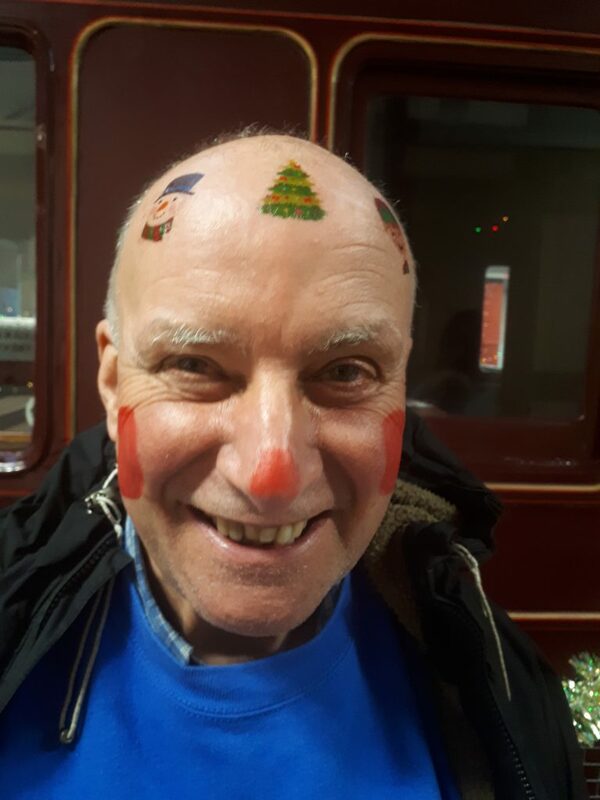 Alan and Tim provided the music with assistance from Matthew on Sunday, Paul B and Mike helped Santa whilst John Davis, Jim, Alison and Jen ran the sales stand. That’s nine of us! With gales forecast, Tim and Matthew took the opportunity to be the first overnight campers in the mess hut to ensure that they were there in good time on Sunday and which we are told worked out well. Jim is seen herein festive mood. Looking forward, the Trustees have approved expenditure on the overhaul of the tender springs and the supply of two spares. It is anticipated that the six existing springs will be uplifted from the shed on Wednesday. The Trustees have also approved the expenditure for a new safety wire system for working at height. It is planned to have this installed throughout the heated and unheated sections of road three of the shed. The technical sales representative of the supplier is due to pay us another visit on Wednesday to finalise details. Finally, just to add to this spending spree, the Trustees have also authorised expenditure on turning tyres and/or journals on a number of wheelsets, namely the three for the Hall‘s tender, two for Caliban and also the two tender wheelsets for FR 20. The work is expected to take place in February. There is something else on the way, but perhaps we’ll leave that for another blog! Alan has completed the latest edition of The Iron Horse which is now with the printer. And a reminder here that it is the annual Christmas dinner on Saturday evening.